S.J. Budd: What motivated you guys to start your own magazine? A.A. Medina: Personally (I believe Dustin will share the majority of these), I wanted to immerse myself into the writing community right out of college. Dustin and I befriended each other in school, and since then, have always worked together. Whether that was trading stories to edit, bouncing ideas off each other, or the occasional venting about the assignments at hand. As we neared graduation, Dustin and I knew that we wanted to continue working together, but we weren’t sure how or on what. I don’t remember exactly how it happened, but we mutually agreed on starting a fiction publication/website. Another big factor was the continuation of my education and routine. In school, we had at least a couple stories to peer review and edit, as well as write our own, each week. My biggest fear was losing that routine and becoming stagnant in my writing endeavors. Dustin Schyler Yoak: It's true, all of those things were factors that led to our decision, but also, I remember we had a discussion about how competitive it is in the industry and there seemed to be a wide gap between top tier magazines and personal blogs, which can be very discouraging to a young, talented writer. So many of our classmates were submitting stories but getting rejection letters with no explanation, and while this is normal, Adrian and I thought, but wouldn't it be great if it wasn't and there was a publication that told you specifically WHY they didn't like your story? AAM: Our overall focus, that Dustin and I both agreed on, was that if we start this thing, that our first priority was to do it for the love of the craft. Everything else takes the proverbial backseat. Monetary gain would be nice, but in all honesty, we make just enough to cover costs. That doesn’t bother me. I wanted to build a community—or at least contribute to a community—of writers, editors, and readers. If we do things right, and with love, the profit will eventually follow. I think we are on the right path. Chris Martin: I was invited to join the team by Adrian Medina about 8 months ago. He told me what it was about and because of my recent direction in life, I thought it a good fit (since I’m an aspiring author). So here I am. SJB: Have you been pleased by all the positive praised it has received so far? AAM: No. I hate it. I want to be hated. Of course! I’m more than pleased—I’m overwhelmed. I figured we’d get a few thumbs up from friends and family and the authors we published, but I totally underestimated the love we’d receive. Even then, I’m only going to take credit for a thin sliver of it; the real praise belongs to our contributors. The authors, artists, interviewees, and reviewers—they’re the real reason we’re even remotely on the radar. CM: Definitely. I’m very interested to see how big of a monster it becomes. DSY: Everything these guys said. Like Adrian said, I figured we'd get a little bit of support or pats on the back or what have you but we've received much more than that. Both of our issues have been compared to Cemetery Dance. Granted, a lot of what makes our magazine great is the content but the fact that anyone could/would say that we stand shoulder to shoulder with an industry titan is just flabbergasting and exciting all at the same time. It's motivated us even more to continue to deliver and step up our game whenever and wherever we can. SJB: What do you look for in a story? DSY: A story has to have something that draws me in. Did I enjoy it? Were there characters I loved or loved to hate? Was there some sort of amazing world or some sort of "WOW" factor so to speak? GL: I really enjoy character development and world building. Dune is a prime example of how to do both. CM: Good plot. Interesting characters. I enjoy a story that lets me escape the real world and play around in a fictional setting. Pretend to be someone or something else for a while. I read it first for the story and only the story. If it evoked some kind of emotion, took me on a journey, or was just downright good, I’ll read it again and look for any technical errors. Since we do not (at the moment) offer payment for stories, we consider ourselves part of the amateur market. Which is fine, we’re amateurs as well. When we get a submission that wets our whistles, but falls short on the technical side of writing (grammar, structure, etc. ), we will take the time to mark it up, make notes, and offer the writer a chance to revise. We don’t ask for payment for the service, we just want that next draft to be an improvement. We want that writer to get better. We want to strengthen the community. SJB: Who are your favourite authors? GL: It's hard for me to play favorites, but I don't think Piers Anthony has ever let me down. AAM: I’m a big consumer of science fiction. I read that genre more than anything. I’m also one of those people who change their favorite (fill in the blank) every few months. So, at the moment, I’d have to say my favorite authors are John Scalzi, Robert A. Heinlein, James S.A. Corey, and Jack McDevitt. The author that had the biggest influence on my writing is, of course, Chuck Palahniuk. I think it’s just a rite of passage as a rebellious, angst-riddled teen to read his books. Survivor is still one of my favorite reads of all time. CM: I like to read fantasy but if I had to list them it would probably look something like this: J.R.R. Tolkien, Terry Goodkind, R.A. Salvatore, Christopher Paolini, Richard A. Knaak, Laurell K Hamilton, Sherrilyn Kenyon, Barb & J.C. Hendee, Wendy and Richard Pini. DSY: You mean who are my favorites NOT counting the talented folks that submit to Aphotic Realm? Growing up I read a lot of Star Wars books so I would have to say Timothy Zahn, Kevin J. Anderson, Troy Denning, and Aaron Allston probably. When Disney bought Star Wars, the novels haven't been as good since they are holding everything back for the movies and I've started to branch out. Aside from Star Wars, I'm a big fan of George R.R. Martin, Jim Butcher, Stephen King, H.P. Lovecraft, Edgar Allan Poe and Paulo Coelho. SJB: Are you writers yourselves? If so, do you have any upcoming projects for your own work? AAM: Yes, I am a writer. My debut novella, SIPHON, falls in the “transgressive horror” genre and will be released on February 2nd, 2018 by Hindered Souls Press. In addition to that, I have just finished a vague outline for a full-length novel that takes place in the same universe as SIPHON. The working title is The Lord’s Lost Children. No idea when that’ll get done, but I plan on having a first draft by the end of next summer. Outside of prose, Gunnar and I are also working on the first issue of our comic, Void & Valor. We’re shooting to complete it by early 2018. ALSO! We are still accepting submissions for our dark fantasy anthology, Grimdark Grimoires! So go check that out. CM: I don’t yet fully consider myself as a writer even though there are people who may or may not disagree with me. I’m currently working on my education in that area as well as working as an editor for Aphotic Realm. As for upcoming projects: I am currently working on, what will be my first novel, though I have no idea when it will be finished at this point. 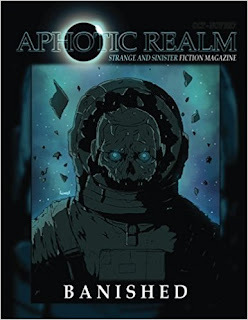 I will also be working on a submission for a future issue of the Aphotic Realm quarterly magazine. DSY: I do write words on things. Sometimes multiple words together... in-between bouts of crippling self doubt and depression that is... I do happen to be working on a short story that I will be submitting around once it is complete in a few days. I have several scripts that I am currently working on in the 30 seconds of free time I have each day as well. One is a comic book script for an urban fantasy/horror series called Reflections. I also have a sci-fi/fantasy animated sitcom, Ditch Reality, which has been a pet project of mine for a number of years. I have a few other projects in various stages of completion or more appropriately--incompletion. SJB: Can you remember what first drew you to strange and sinister fiction? Was it a book or comic? Or perhaps a film? I was obsessed and it kind of became the nightly ritual. That’s also how I discovered MST3K at a young age (another big influence). It wasn’t until a month after we started Aphotic Realm that I realized that Aphotic Realm is essentially a synonym for Twilight Zone. Go figure. CM: My experience with strange and sinister fiction is limited to IT and Eye of the Dragon by Stephen King, and the Anita Blake series by Laurell K. Hamilton. I’ll read anything if I’m told it’s a good story and it will take me somewhere I’ve never been before. GL: I'd have to say that it was probably music. Listening to extreme metal brought me into the world of occult books and Lovecraftian themes, so I kind of just branched out from there. An album that stands out in particular is "Blessed Black Wings" by High on Fire. DSY: Star Wars got me into the sci-fi/fantasy world as a kid but it would probably be the Goosebumps books by R.L.Stine that drew me to the sinister side of storytelling. I wasn't allowed to watch horror movies or read Stephen King as a kid or teen so Goosebumps was really my only gateway to that hair-raising feeling. The first Resident Evil was also great fun. I only got to play it at a friend's house but we played that game in one sitting all the way up until the giant spider boss near the end. When you shot the spider hundreds of smaller spiders would spawn from it. My friend had a crippling fear of spiders, freaked out and powered off the console. Unfortunately, we didn't have a memory card to save our progress, so EVERYTHING was lost. Yeah, I was mad at him and we didn't play the game again. SJB: What’s next for Aphotic Realm? GL: We'll probably just keep talking to Gary Buller about dicks and general masturbation on Twitter. CM: The Realm’s website is steadily taking submissions and there have been some interesting stories to come across my desk of late, soon to be uploaded to our site. Be sure to stop by the site and check it out. DSY: We'll be announcing a few things very soon. The very next thing from us is going to be Mandi Jourdan's Shadows of the Mind Collection. We're all pretty excited about that. It's going to include the eight stories that started it all on our website plus five more exclusive to this collection! Gunnar did the artwork for it and it very much fits the theme of escaping The Division. AAM: Lots ‘o’ Thangs! We have already fleshed out most of the details for the next few issues. In addition to that, we have a handful of other things we can’t really announce yet, but are gaining some traction behind the scenes. We aren’t planning on slowing down, either. Each story we publish, each issue we put together, each interview we conduct; we learn something new. Things will only get better as time goes on. We set a goal to do an update the first week of every month, so be sure to check www.AphoticRealm.com obsessively. Better yet, make it your home page. Click the “Refresh” button no less than three times an hour.